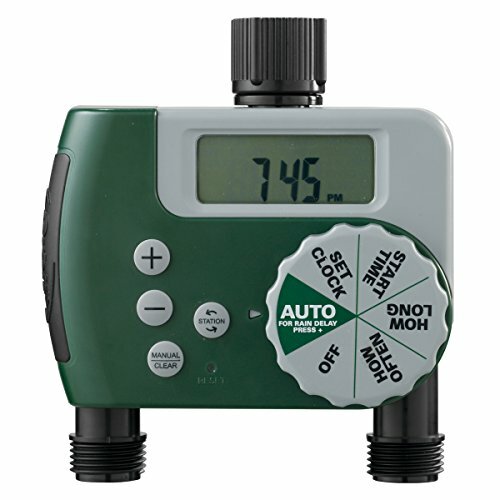 Programmable wate﻿r timers enable you to effectively control the watering frequency and duration from a hose. Digital & analog hose faucet timers will include LCD screens for simple programming. Common features will include the ability to set a clock, set watering times, adjust frequency and automated preferences. 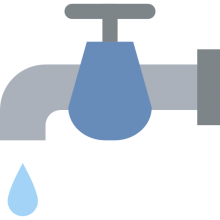 Many property owners have opted for hose faucet timers to ensure that they will not be stuck with a bunch of dead plants because they forgot to water them a couple days in a row. As well, no more hassle and dirty looks from neighbors after you forget to turn your sprinkler system off- now you can program a faucet timer to turn on and off automatically. The water timers we listed below are pretty easy to use right out of the box. They include basic features like easy-to-read dials and LCD display screens (for the digital devices) that make programming a cinch and will help you to conserve water and even do manual watering that overrides the programming you input. Let's take a look at 5 of the best-reviewed water timers. Our favorite shut-off water timer is the Orbit, which comes in one, two or three-valve configurations. The Orbit includes an LCD screen that is larger than other options- and is incredibly readable despite the relatively small size of this 13.6 oz water timer. It features solid controls to adjust the watering frequency and duration, rain delay as well as manual watering abilities to ensure maximum water conservation. The two alkaline batteries that power the unit are not included, which is somewhat annoying. Manufacturers claim that they are actually upwards of 4000 on and off cycles that can be configured using this unit. Users compliment this digital water timer for its easy to use navigation system and low price. It's not overly complicated to use and most landscape artists were able to set up schedules pretty quickly. It's not to be overstated that the simple interface and use of scheduling is one of the best features of the orbit digital water timer- many users recall more complex analog units that were entirely cryptic regarding how to effectively set up watering schedules. Definitely a quality water timer with a ton of solid user feedback. Users of the Orbit Single-Dial Water Timer consistently remark on the great value of this product. For its price it is surprisingly durable. Many users have remarked that this water timer seems as though it is built to last, and say that they have strong confidence that it will not need to be replaced or repaired in the foreseeable future. All of this is complemented by its cost efficacy. Many users comment that this product costs less than other similar models they have used in the past. Many note that this is because of the simplicity of its design, which for most users is described as a good thing. The simplicity of the control features, some users of the Orbit Single-Dial Water Timer note, keeps set-up and operation from being confusing or overly time consuming. At the same time though, some users note that the simplicity of design actually limits the applications of this product, or at least reduces the options for use. Multiple users have noted that the price, durability, and ease-of-use that this product provides has led them to buy two or more (sometimes up to 6!). Using many of the Orbit Single-Dial Water Timers, some users have been able to program out automatic watering schedules for their entire lawns, gardens, and even rows of potted plants. A few users have noted that, as with many water timers, after a full season of use the Orbit Single-Dial Water Timer has sometimes begun to leak due to interior defects. Users of the Melnor ﻿Two Zone Electronic Water Timer (video above is for the 4-zone) write that this product is a good value and of much better construction than many products they've used in the past. The two zone system allows users to program two different watering schedules for different areas of their lawn or garden, providing an easy and stress-free way to keep up with the needs of different types of plants. One user notes that there are glitches in the system, but they still believe it is the best value for what it does. While most reviews are overall quite positive, a number of users reported that battery life is too short. While many users describe the Two Zone Electronic Water Timer as efficient and reliable, a significant number of users noted that their units lasted only one season before one or both of the watering zones became defective in one way or another. When discussing the Raindrip Analog Timer, many users noted the simplicity of its design and the ease-of-use. Users appreciated the quickness with which they were able to set up the product and get it programmed to do just what they'd needed. As with the users of many electronic timers though, users of the Raindrip Analog Water Timer were disappointed by the use of thin plastic in construction and some users have doubts about the durability of this product. That being said, one woman notes that it's functions fill exactly the niche they ought to. The Raindrip Analog Timer enables her to keep her chickens alive and happy during days that sometimes reach triple digits! Users appreciate the analog three-dial configuration of this unit, which many see as more durable and reliable than a digital LCD system when exposed to the elements. While it did not necessarily lead to customer dissatisfaction, many users found it worth noting that more intensive watering schedules will lead the Raindrip Analog Timer to burn through batteries very quickly. One user notes that it is to the point that she has to replace the batteries every two weeks. That being said, she is more than happy with the health of her tropical plants! Many users of the Melnor 4-Zone Digital Timer were pleased with the simple and straight forward programming system. This allowed for easy set-up and quick installation and a yard watering system that responds to the needs of the user. The 4-Zone system allows many users to program out watering schedules that work for a variety of different plants and contexts including lawns, gardens, trees and shrubberies, as well as potted plants and flowers. A rather consistent complaint expressed by users of the Melnor 4-Zone Digital Timer addressed the product's durability. Many users noted that the timer lasted only one season before one or more zones ceased working. Some users noted that it took less than a full season, but only a month or so before a zone failed, causing damage to plants and gardens. Some users were also disappointed that the simplicity of the design of the Melnor 4-Zone Digital Timer meant that this product was not as versatile as others in its price range. Users of the Nelson Shut-Off Water Timer appreciate that this product is affordable for those on a wide-range of budget levels. Many users write that it is an effective way to stay economical about usage as well, whether it is to keep them from flooding their backyard when they forget to turn off the faucet, or even flooding their basement when filling plastic tanks. One user writes that it is a handy tool that helps keep him from dealing with the messy consequences of these types of senior moments. Users also note that the Nelson Shut-Off Timer allows them to regulate the pressure when watering plants and lawns. Many users were disappointed with the Nelson Shut-Off Timer as well though, citing the plastic construction as one of the main sources of dissatisfaction. The construction is blamed by many users for short lived use. This product, like many others in its price range, received many negative comments referring to its leakiness. After a season or two many users noted that the Nelson Shut-Off Timer had to be replaced. A few users noted that this is the nature of these products, and that at such a low price, not much more can be expected. Finally, the analog dial on the Nelson Shut-Off Timer was also a problem for a few users, who noted that it was hard to program accurately. If you are considering purchasing a digital timer to provide timed watering automatically to your lawn and garden, read our reviews above and also check in on the comparison table to compare the different options available on the market today. These are are pretty nifty options that can save you a ton of time as well as conserve water. Additionally, you can purchase multiple valved digital timers so you can effectively water a large property from a single hose faucet.